Recently, Maxis approached us with a very interesting proposition. 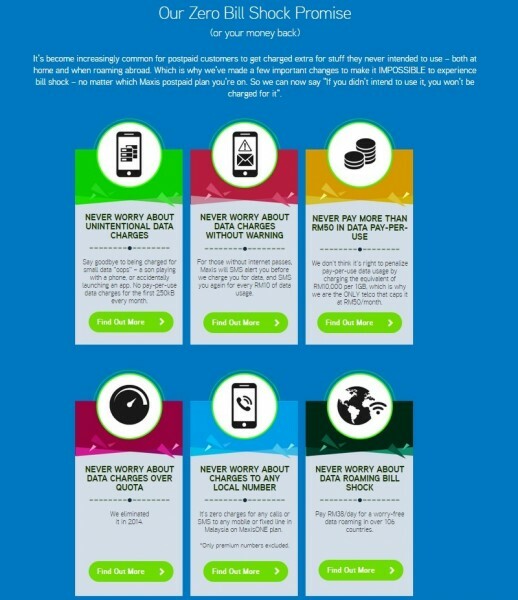 Alongside a few other publications, the local telco wanted us to really test out its “no bill shocks” promise for its customers, which is a statement made as part of its 2015 “Unmatched Customer Experience” programme. 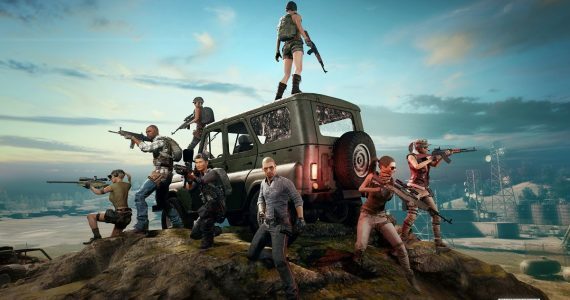 We were told we could do virtually anything we wanted to see if we could break the company’s many fail-safe measures to ensure the consumer does not end up with, well, a bill shock at the end of the month. How could we even say no to that? 1) Accidental data usage: what happens when you are not subscribed to any mobile data plans and accidentally turns on mobile data on your smartphone and start surfing the Internet? 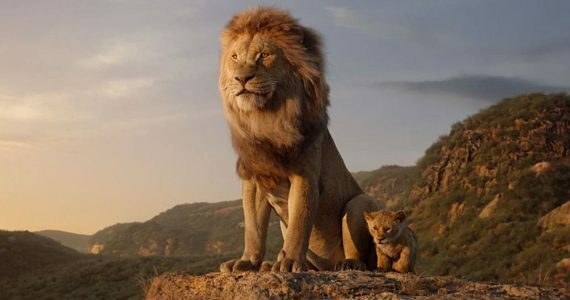 2) Data roaming: what happens when you activate data roaming while overseas, and not checking which local carrier you’re connected to and just start using the Internet straight away? 3) “Excessive” calls: what happens when you use the phone like someone in a teenage relationship? With these in place we set out to test each criteria with the help of the entire editorial team. Here’s a detailed report on how our stress tests went. It is a scenario that most of us will probably never face as we become more and more Internet savvy, but there have been cases when we pass our phones to our children, who then decides to go on a YouTube binge. Or, maybe our less-savvy parents decide to surf the Internet on a smartphone with no data plan and not connected to WiFi. These things do happen, and we set out to see how Maxis ensures no bill shocks in this area. 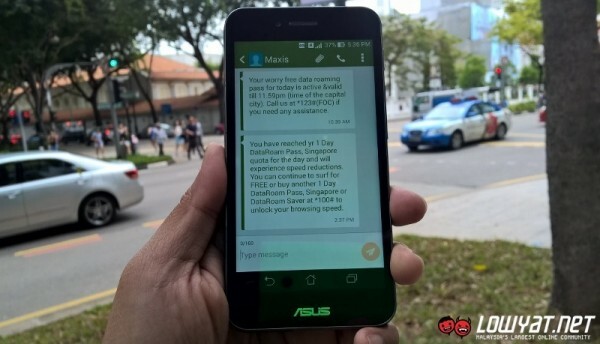 According to Maxis, there is a 250kB buffer that won’t be charged should a user accidentally use mobile Internet data, and users will be sent a warning SMS when pay-per-use (PPU) Internet is being used. Should the user continue using data without any Internet plan, they will automatically be subscribed to a 50MB Internet pass for RM10, with up to five passes issued for a maximum charge of RM50 per month. Obviously, the price isn’t cheap – after all, this qualifies as pay-per-use data. 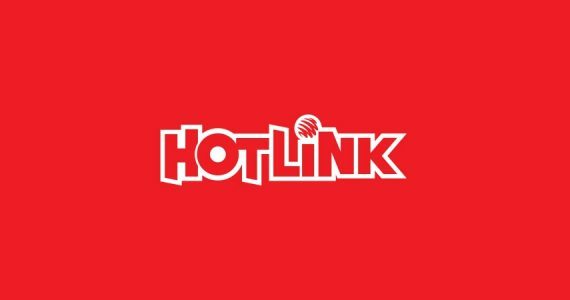 With Maxis’ #Hotlink prepaid plan offering free basic Internet at all times, the only Maxis product that does not have any bundled mobile Internet plan is TalkMore, which was what we used for this test. First, we set up our test device to make sure there is no background sync running; we disabled as many as Android allowed us to while leaving instant messaging apps such as WhatsApp and Facebook Messenger running for the test. That being said, there were quite a few of Google/Android services which cannot be disabled. Originally, we wanted to see just how much 250KB of data would allow us to do. Maxis says this amount is enough if you accidentally open YouTube and immediately close it, but we were more curious about how long we could last using WhatsApp and Facebook Messenger with this “buffer”. We’d then proceed to monitor the usage using Android’s built-in data monitor, before seeing how mobile websites would load on just 250KB of data. At least, that was the original plan. About 10-15 seconds in after turning mobile data on, we received an SMS from Maxis saying we are now automatically subscribed to a 50MB mobile Internet pass, and would be charged RM10 – despite the data monitor only showing about 53KB of use. 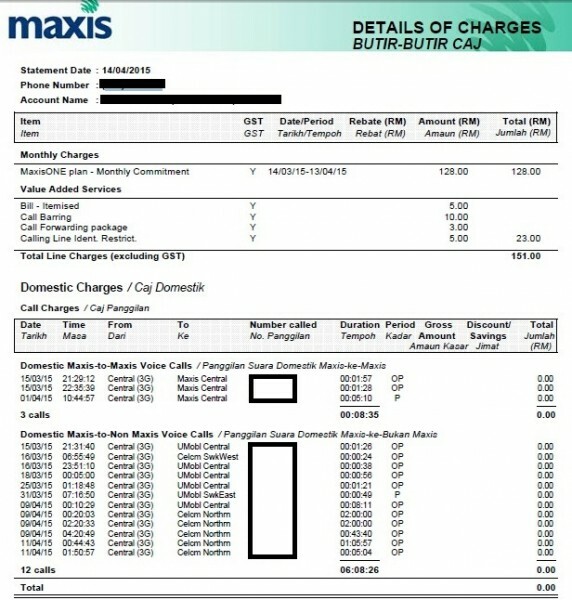 Despite Maxis’ promise, we did not receive the warning SMS that mobile data had been turned on, and instead we were immediately charged RM10 for a 50MB Internet pass. We spoke to Maxis about this, and we were told that Android’s built-in data usage monitor is not the most accurate indicator. This is a feasible explanation, but it is disappointing that the first line counter-measure -the warning SMS – did not come through. Undeterred, we asked a different question: what can you do with 50MB of data? Quite a lot, actually. We browsed a host of web pages on Google Chrome and on Opera, sent and received several WhatsApp pictures and audio clips, sent several messages on Facebook Messenger and only racked up about 25MB. We then continued with a minute-long clip on YouTube which used about 20MB of data. When approaching the 50MB limit, Maxis sent us an SMS indicating our usage, and even suggested to subscribe to a Mobile Internet Pass for greater value. Maxis automatically subscribed us in RM10/50MB blocks of Internet up to a maximum of 5 blocks for a total of 250MB at a maximum charge of RM50. 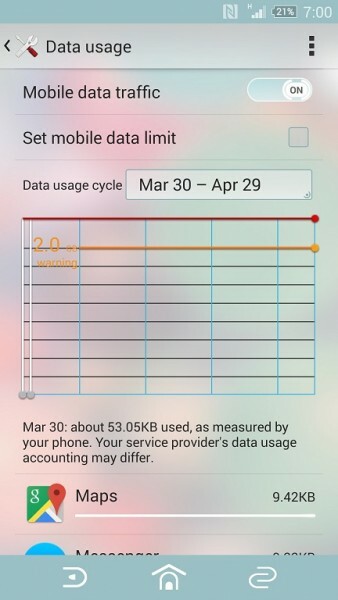 It will also send a warning message at the 40MB mark of each block to warn about the data usage. 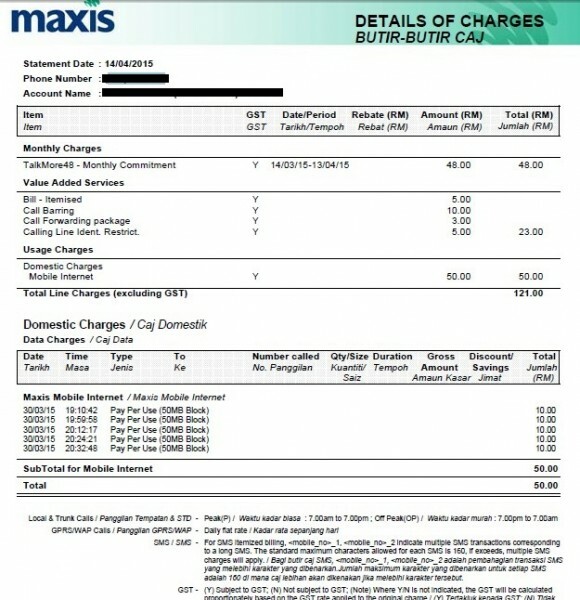 After the fifth block, Maxis will not charge any more for data, and instead throttle the data for the rest of the month. VERDICT: BILL SHOCK. We don’t think there is such a thing for “accidental data usage” for a smartphone user because everything is so connected. 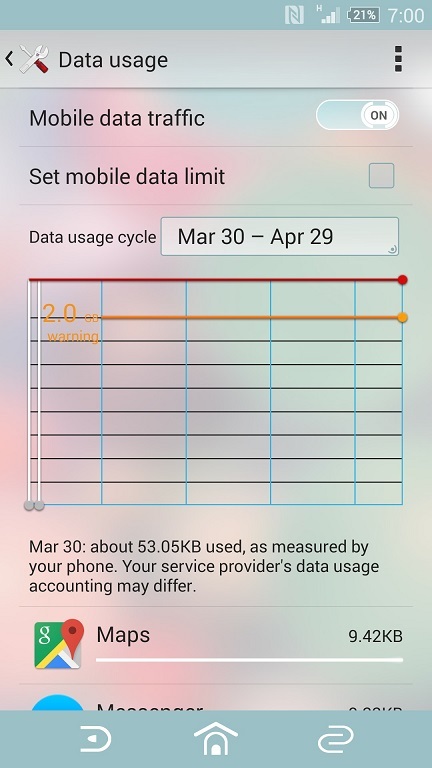 Once you activate mobile data, everything will start syncing and 250KB is way too little. It would probably work on a feature phone user with minimal connectivity. On the other hand, automatically subscribing users to RM10 blocks with regular SMS warnings mean users will be less likely to be totally unaware of their mobile Internet usage. 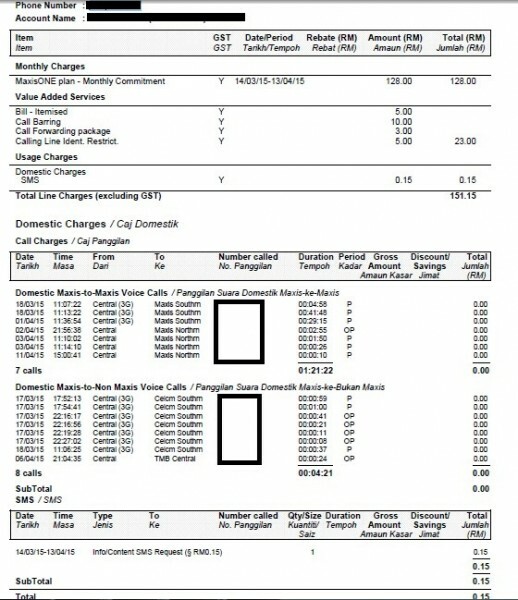 Perhaps the killer “bill shock” scenario for many would be accidental data roaming. 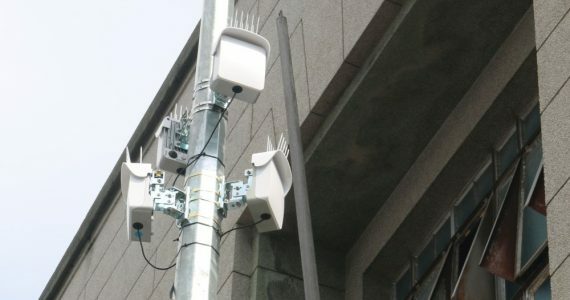 We’ve seen and heard countless horror stories that would send a shiver down the spine (and wallet): enabling data roaming thinking either: a) they’re connected to the correct local network, or b) thinking that their local monthly data plan covers international data roaming as well. It may seem a little far-fetched, but these things have actually happened – and Maxis wants to make sure it isn’t charging you excessively for your inexperience. 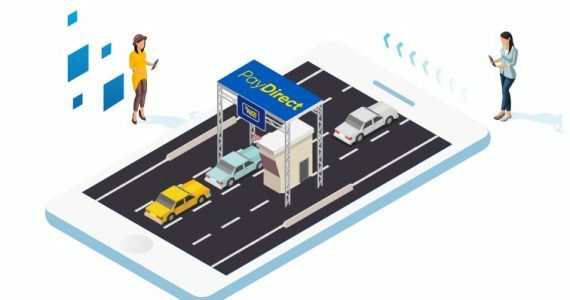 According to Maxis, MaxisONE users are hard-steered towards the partner network where the user is roaming in, and will automatically register on that network. Users will even be automatically subscribed to a Data Roam Pass at RM38 per day once pay-per-use usage exceeds that amount. 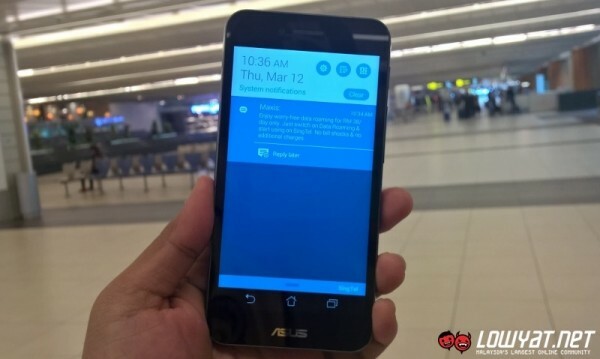 The first thing in my checklist was to see if I was able to connect automatically to Maxis’ roaming partner in Singapore, Singtel. True enough, my phone directly connected to Singtel less than 2 minutes from the moment I turned on the data roaming option on my phone. 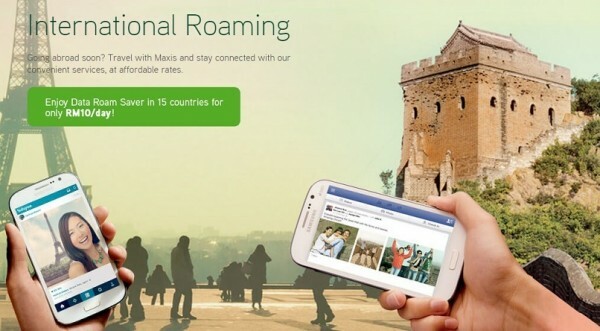 The MaxisONE plan also offers a Data Roam Pass for data roaming which costs RM38 per day for Singapore. 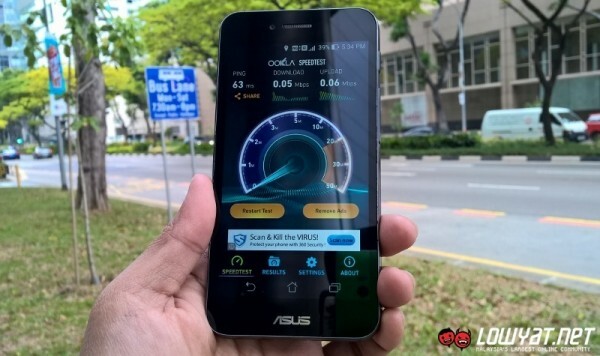 From a quick speed test that we did with full bar 4G connection in front of Singapore Management University that is located at the intersection of Bras Basah Road and Victoria Street, we managed to reach a maximum data speed of 48.83Mbps for download and 5.97Mbps for upload. However, the Data Roam Pass comes with a 250MB quota and once the limit has been reached, the user’s data speed will be throttled – by a lot. When that happened for me, I conducted a speed test at the same location, which showed that our connection speed decreased significantly to around 0.05Mbps for download and 0.06Mbps for upload. Obviously, the throttled experience is rather harrowing; just imagine from going full blast at 4G speeds and then immediately dropping to dial-up speeds once I hit my quota – which I managed to hit pretty quickly as I was tethering the Internet connection to my laptop for work. 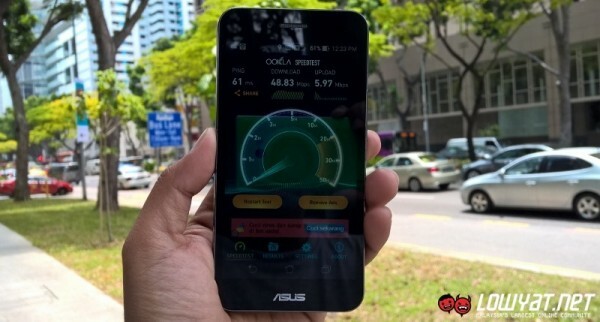 While users are able to restore the high-speed connection once again by paying for another Data Roam Pass or a cheaper Data Roam Saver Pass, Maxis’ Data Roam Pass is definitely not as competitive as other telcos’ roaming policies which offer unlimited high-speed Internet for a fixed amount. On the second day, I did not subscribe to another Data Roam Pass as my flight home was in the afternoon. I proceeded to surf on a pay-per-use (PPU) policy, racking up about 12MB of data – which is not that much. What I hadn’t realise was that PPU charges for Maxis data roaming is RM30 per MB, so Maxis automatically subscribed me to another Data Roam Pass. VERDICT: NO BILL SHOCK. 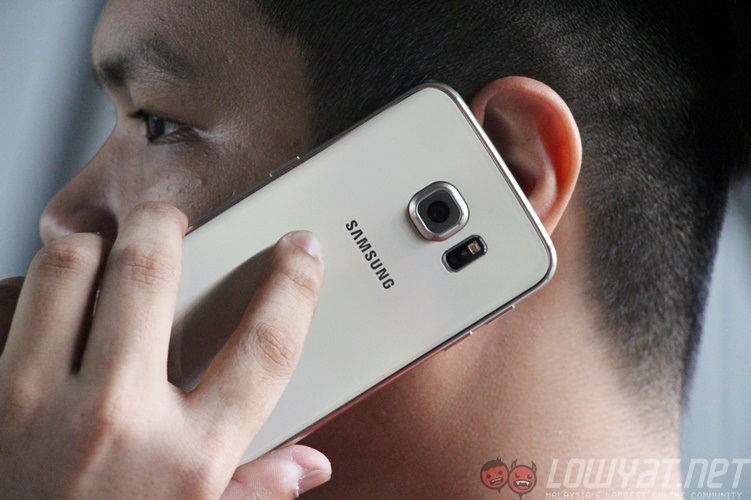 It is certainly very convenient for users that Maxis hard-steers users into its roaming partner, taking the hassle out of users’ hands. The Data Roam Pass also has a fixed price of RM38 for 106 different countries, unlike other telcos which have varying data roaming charges. 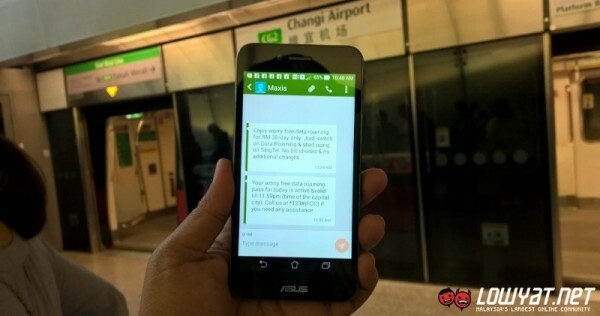 That being said, we’re not sure why Maxis imposed a 250MB quota for its Data Roam Pass. 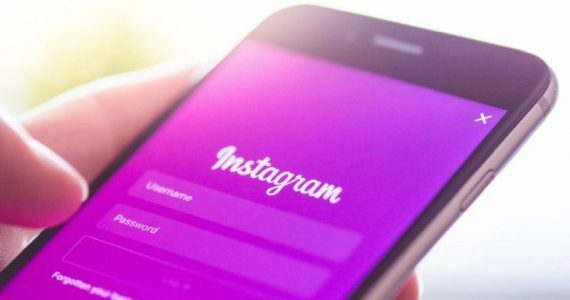 For most tourists, that may be enough to stay connected and be active on social media, but for businessmen or members of the media or anyone who wish to use data roaming while tethered to a laptop, that amount is certainly insufficient. Finally, our last stress test, and probably the easiest: could you encounter any bill shocks while using the MaxisONE postpaid plan? For many of us, the idea of a postpaid plan that offers unlimited calls and SMS seems like an offer that’s about several years too late. Most of us, especially in urban areas, virtually don’t make calls anymore, let alone send SMS. That being said, Maxis’ internal research team have discovered that many more of its consumers around the country do not share this usage pattern, and that the take-up for MaxisONE has been encouraging since its inception. While most of us here in the editorial team would not be able to stress test the product, we found one who might fit the bill: our intern, Terry. A final-year student in a local university in a steady relationship, Terry fits the bill as someone who would spend countless hours on the phone if they were given the chance. In addition, I passed another MaxisONE SIM card to my parents, as we have also been told that some middle-class Malaysians subscribe supplementary MaxisONE plans for their parents because of the plan’s convenience and simplicity. The SIM cards were passed with basically one message: call whoever you want, chat for as long as you want (or can), with the only condition that they do not call overseas numbers. After three weeks, here’s what we found. Our intern spent about five hours on the phone in just 48 hours, gleefully accepting the challenge set upon him. Over the next three weeks, he racked up another six hours of talk time. 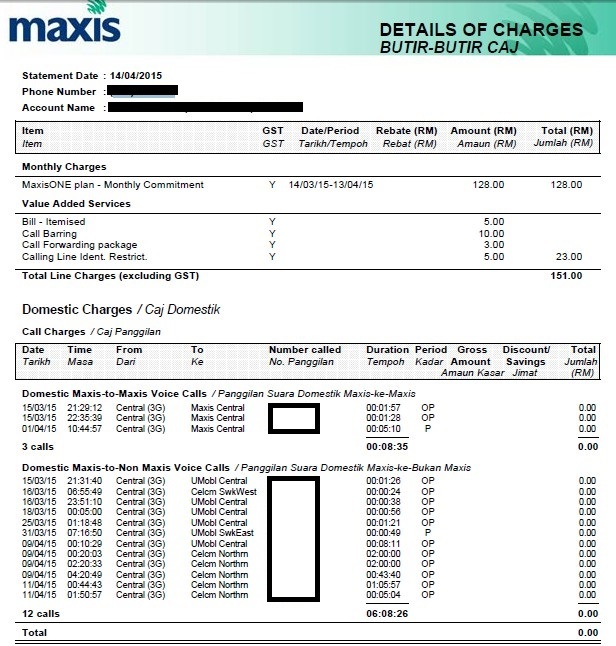 That’s a total of 679 minutes, which would equate to about RM135.80 in call charges if he were using SurfMore and calling non-Maxis numbers. 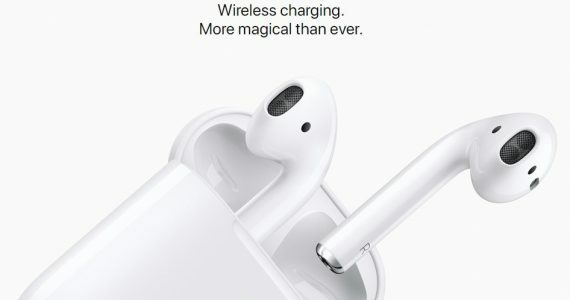 He continued using the device regularly for the next three weeks as a secondary device, regularly using the 2GB of mobile Internet during events coverage. The other SIM used by my parents yielded more modest savings. It was to be used as the go-to device for catch-up calls to our relatives, and with no worries on call charges, they can surely go on for quite a bit. At least, that’s what I’d thought. 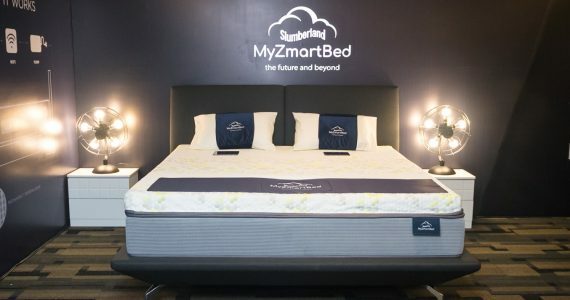 In the three weeks of usage, they managed to rack up a total of 125 minutes, which would have amounted to RM25 in call charges if they were on SurfMore. This was odd, but it was easily explained when I spoke to them about it. With Telekom Malaysia no longer charging for calls made to any fixed line number in Malaysia, it made more sense for them to call using the wireless telephone at home. In terms of data, the 2GB of data was deemed enough for our intern, who uses a 1GB data plan. As a student, he mainly uses data on instant messaging apps, Facebook and Instagram, while the home WiFi connection means he doesn’t spend a lot of data overall. VERDICT: NO BILL SHOCK. 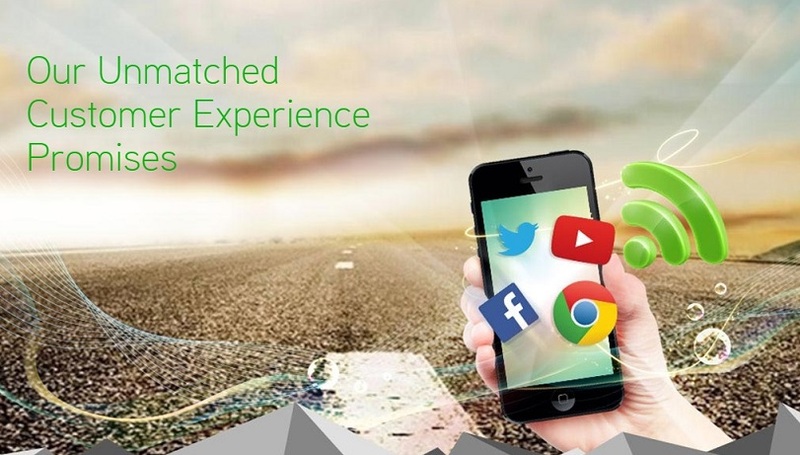 There’s virtually no way a normal consumer would spend that much time every month to fully utilise the “limitless” calls and SMS that the MaxisONE plan offers. 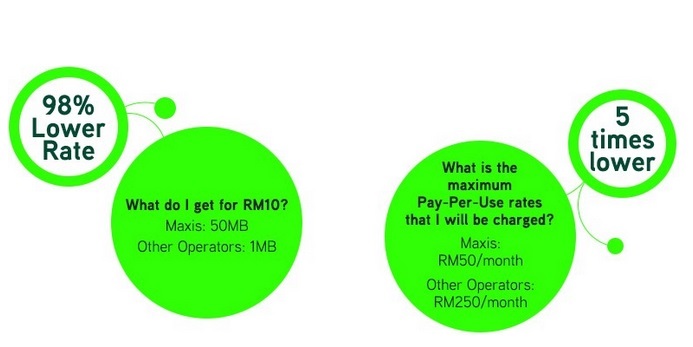 Though doubts still linger about its modest data allocation (especially when other telcos are stepping up their game in this aspect), Maxis is confident that there is a significant market that find the MaxisONE plan genuinely good value for money. Under current CEO Morten Lundal, Maxis invested heavily in its backend, with the ultimate aim of delivering what Maxis could proudly claim as an “unmatched customer experience“. Of course, as a profit-making business, it also has to find ways to generate income, but Lundal and his team are committed to ensuring none of the profits are derived from what the team calls “accidental profits” such as accidental data use, or accidental data roaming. With the new fail-safe measures in place, our tests have shown that they do work – though from the results it is also obvious it could work on some alerts that were promised, but did not come our way. That being said, it is definitely an encouraging sign that Maxis is looking to find ways to innovate itself as a service provider that provides exceptional customer service. No other local telco offers some of the services we tested above, let alone be confident enough to offer a money back guarantee if its customers experience any one of these “zero bill shock promises” are broken. We’ve said before that local telcos are finally upping their game in terms of competitiveness. Now let’s see what else is in store for Malaysian consumers in the near future. Disclaimer: Besides Lowyat.NET, Maxis also engaged other online publications as part of its ongoing marketing campaign. However, the editorial team had full control over the tests (which were devised ourselves) and the results are displayed as-is, with no external influence to amend any part of this article.